This special release has a Beer Advocate rating of 98! Starting with six different hop varietals added to the brew kettle & culminating with a massive dry-hop addition of Simcoe hops, Bell’s Hopslam Ale has the most complex hopping in the Bell’s repertoire! 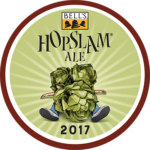 Check in your Hopslam on Untappd before 2/6 and get a celebratory badge! Sign up for our newsletter to get updates on all our hot new beers and fun events!